Lock in a great price for Crowne Plaza Leeds – rated 8.7 by recent guests! Menu a bit limited. Ver standard dishes. I liked having Starbucks in lobby! Entertainment area, large lobby with bar and restaurant perfect for families and friends. The staff, especially on reception, were excellent. Lovely hotel, a little bit of a walk to get the the main shopping and drinking area but Ubers were less then £4 so it didn't bother us. The spa is lovely, staff super friendly and overall this is a very nice hotel. Leisure club was enjoyable and staff very helpful. We treated ourselves to back massages which were done by a very pleasant masseuse called Shira. Reception and dining staff were also very friendly and helpful. The hotel on the whole is beautiful. Staff is very attentive and can answer all questions. Location is perfect for shopping, restaurants & pubs. There is a gorgeous indoor pool. Room service was great - very prompt and helpful. Room was spacious, clean and comfortable. Staff were incredible!! Helpful from check in throughout my whole stay. Getting Orange Juice at 1:30 in the morning, looking for lost bag, to asking if I needed anything every time I walked by. The breakfast was great and was kept fresh. Even when I showed up 5 minutes before it ended they refilled with Bacon, fresh eggs and sausages. Bar staff was excellent with great Lattes and drinks. Really overwhelmed with how nice everyone was. 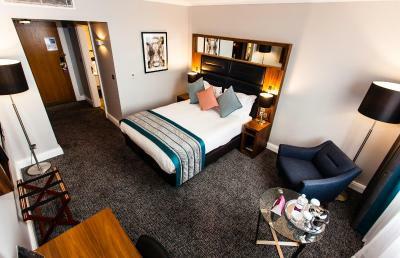 Crowne Plaza Leeds This rating is a reflection of how the property compares to the industry standard when it comes to price, facilities and services available. It's based on a self-evaluation by the property. Use this rating to help choose your stay! In the heart of Leeds, Crowne Plaza offers a luxurious spa, an indoor swimming pool and modern rooms, and Leeds’s bustling shopping area is just a 10-minute walk away. With complimentary newspapers and stereo systems, all rooms at Crowne Plaza Leeds also feature air conditioning. Tea/coffee facilities, an in-room safe and hairdryers are also provided. Along with a large gym, whirlpool bath and sauna, The Spirit Health and Leisure Club also has a range of beauty treatments for guests. The menu at Bar & Kitchen @ LS1 includes contemporary British classics with a Yorkshire twist. Starbucks coffee and pre-dinner drinks can be enjoyed at Bar @ LS1 from the Bar Lounge menu. Leeds Shopping Plaza is located next to the hotel, while Harvey Nichols is 5 minutes’ walk away. The Royal Armories Museum is only a 15-minute walk, while Leeds Rail Station is 2 minutes away on foot. When would you like to stay at Crowne Plaza Leeds? 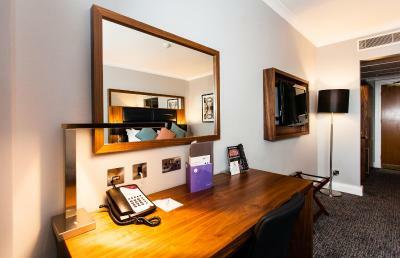 All rooms at Crowne Plaza Leeds feature air conditioning, flat-screen LCD TV, tea/coffee facilities and hairdryers. Extras include, complimentary mineral water, free toiletries, earplugs, lavender spray and a night light. WiFi is available in this room. Please state your bed preference when booking. However, please note this is subject to availability and can not be guaranteed. Private parking is available on site (reservation is not needed) and costs GBP 15 per day. A specially adapted accessible room for guests with additional mobility requirements. These rooms feature vibrating pillows, pull cord emergency system, support rails, an extra wide door, a lowered bath and sink, visual fire alarm, bath hoist, and thermostatically controlled hot water supply to taps. These twin/family rooms contain 2 double beds and can sleep a family of 4. There is also a double sofa bed which can accommodate up to 3 adults. Some family rooms are also interconnecting. For sofa bedroom or interconnecting rooms please contact the hotel for availability. Additionally, this room also features a sitting area. This room can accommodate 3 adults or 2 adults and 2 children. Additionally, this room also offers exclusive access to the Club Lounge. Additionally, this room offers a sofa bed. Park up in the on-site car park at the Crowne Plaza Leeds and check in via our appealing reception. Our knowledgeable and friendly front office team will help you settle in and can give advice on the hotels facilities and the surrounding area. There is a fully equipped Spirit Health Club – free to use for all hotel guests. Our newly refurbished Mezzanine Lounge in Leeds is the perfect place to catch up with friends and family. House Rules Crowne Plaza Leeds takes special requests – add in the next step! Crowne Plaza Leeds accepts these cards and reserves the right to temporarily hold an amount prior to arrival. A fee of GBP 50 will be charged in case of early departure. Children under the age of 12 stay and eat for free. We were supposed to get a “City View” room. Instead got a fifth floor room looking away from the city and the glazing in the window was full of condensation so couldn’t really see a lot. Good location. Comfortable and spacious room. Good facilities on offer at the hotel. Good price. I went for a swim in the morning and the pool was not open on time. It was only slightly late but when staying for business, time is of the essence. The staff were excellent and made the effort to provide food not directly on the menu for myself and my colleague. They also remembered our names without prompting which made us feel welcome. Restaurant limited food not much selection and pool area not as clean as it could be,scum line needed cleaning. I just didn’t like how you had to pay for parking at the hotel, as I didn’t realise this until I turned up on the day. Easy to get to, lovely rooms, all the staff was really nice, nice food. Beds. Too small not long enough I’m 5ft 9. The staff were fabulous in particular the Male receptionst. Currently pregnant and wanted some chocolate and he gave us his Easter egg. He was so courteous and helpful. Building works out side my window , they weren't not very noisey however i could hear them at 9am as i left my window open ajar , but i didnt go for the view or a lay in so wasn't a problem. The room was as beautiful as the rest of the hotel. The facilities at this hotel are fabulous and location is great , if you want a bit of luxury and pampering in the spa then this is the place . Highly recommended place , it is the best hotel I've stayed in , i can't wait to book my next trip here . Swimming pool looking a bit tired .. tiles etc . Comfy beds . Great staff. The manager at breakfast was quite abrupt, and the breakfast was OK but overpriced. The location is fine, but a little way out of the centre if you're not up to walking too far. Although a taxi was only £3! The staff at reception were great, lovely welcome. The rooms are spacious, beds comfortable with little luxury amenities. Very clean, lovely bar and lounge. Great having a mini fridge in the room, and robes/slippers.